When a wisdom tooth is erupting, it can become partially or fully trapped. It will not break through the gum tissue properly. This can cause it to grow in at an angle or laying down underneath the tissue. This can be painful. In some cases, it can cause an infection. If your jaw is not large enough to accommodate another set of molars, the wisdom teeth can push on your other teeth, leading to overcrowding. This can change your bite and make your teeth harder to clean. This increases your risk of tooth decay and gum disease if the overcrowding is not resolved. When the teeth do not erupt correctly, a fluid-filled sac, known as a cyst can form around it. This can be painful and lead to an infection if the tooth is not taken out. Your dentist performs a visual examination and takes diagnostic images to evaluate your teeth and oral structures. Based on their findings, they suggest either a surgical or simple extraction to remove them. If the tooth is visible above the gum line, a simple extraction is used. An anesthetic numbs the area to ensure your comfort. Your dentist loosens your tooth before removing it with forceps. When the tooth cannot be seen above the gum tissue, it needs to be surgically removed. Your gum is opened to expose the tooth. In some cases, bone or tissue may need to be taken out. 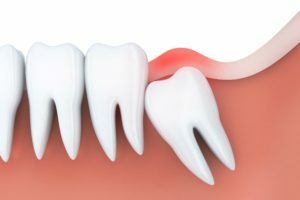 The tooth is then broken into smaller pieces before it is extracted. Sutures are used to close the tissue to allow the area to heal. If your wisdom teeth are giving you grief, it is never too late to have your wisdom teeth removed. Allheart Dental Implants & Orthodontics provides modern dental care in a comfortable office. We provide many areas of specialty services, including wisdom tooth extractions. We offer the consultation you need to stop your pain. If you need to have them removed, contact our office today to schedule an appointment.